Easy Greek Spinach pie recipe for Beginners! Listen to the crust crackle as it cools.. And the smell.. Pure bliss! Do you need more reasons to start making your own Spinach pie? And if you are thinking that making it must be really hard, think again! We have the perfect easy Greek spinach pie recipe just for you! It doesn’t matter if you haven’t made a pie before (or are a complete cooking novice). This amazing easy Greek spinach pie recipe is made in only one hour from scratch! And for the ones wondering if it is worth making your own spinach pie at home, the answer for me is very simple. Nothing compares to the smell of some fragrant, warm, golden freshly baked homemade pie! So trust me on this, after you make this easy easy Greek spinach pie recipe, you will never go for the store version again! The main ingredient you will need to make this super easy Greek spinach pie is of course spinach. Most spinach pie recipes also use feta cheese which is a favourite ingredient in all types of Greek recipes, be it fried, baked or used for stuffing until nicely softened and slightly melty. A mature feta cheese gives this traditional spinach pie recipe a bold and salty flavour, so be careful to just a little salt in the seasoning! 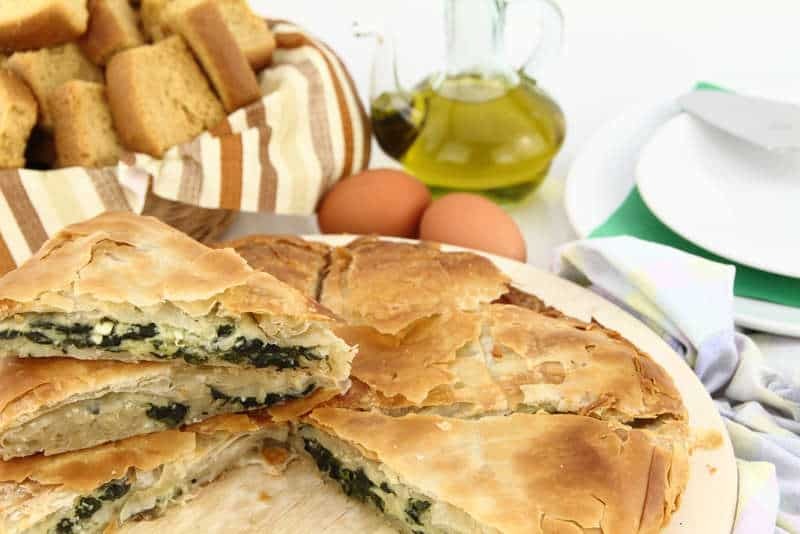 If you choose to prepare this Greek spinach pie recipe with commercial phyllo dough make sure to brush each sheet with good quality butter, which gives a very rich flavour and amazing smell! When preparing phyllo based Greek pies, like this spinach pie recipe, a little trick to make the phyllo crispier and flakier is to sprinkle the melted butter over the phyllo sheets, rather than brushing them. Working with phyllo can be tricky as its brittle and can dry out very quickly, so check the handling tips before start preparing this Greek spinach pie recipe. Don’t forget to brush the top of the spinach pie with enough butter and scar with a knife to help release the steam. For a lighter version you can substitute the butter with good quality extra virgin olive oil. So go ahead, give this super easy Greek spinach pie recipe a try and amaze your friends and family with its crispy and tangy flavour. Enjoy! If you choose to prepare this Greek spinach pie recipe with commercial phyllo dough, it is important to thaw completely the phyllo dough by putting it in the fridge from the previous day. For the beginners at working with phyllo, check the handling tips before start making the spanakopita. To prepare this spinach pie recipe, sauté the onions in a large knob of butter until soft and turning golden. Add the garlic and cook for a couple of minutes. Add the spinach in batches and cook until wilted. Cool, then tip into a bowl (leaving behind any excess liquid from the spinach) and mix in the nutmeg, feta, eggs, spring onion and season. This will be the filling of the spanakopita. For this spinach pie recipe you will need a non stick baking pan, about 20-22cm. Put the first sheet of filo in the pan and brush with butter, letting the excess hang over the sides. Keep going with the rest of the sheets, turning a little before adding each additional pastry sheet and brushing all over with butter. When all the pastry is used up, tip in the filling of the spanakopita and fold over the excess pastry to cover. If you like to prepare a larger pan of spanakopita for a big crowd, double the ingredients for the filling and use a 25*35 cm baking dish. Layer the 4-5 phyllo sheets to form the bottom of the spanakopita, tip in the filling and top with 4-5 more phyllo sheets. Butter the top of the spinach pie with melted butter and scar with a sharp knife. Bake in preheated oven for about 30 minutes until the filo is crisp and golden. Leave the spanakopita cool down for 10-15 minutes before cutting into pieces. Serve the spinach pie with Greek feta salad. Enjoy! This looks great I will try it thanks for sharing on facebook!! yum this sounds really good. Thanks for sharing.